Pop. 2,324. On L. Superior at the mouth of the Aguasabon R. on Hwy 17, 78 km NW of Marathon. Pop. 1,968. In Thunder Bay Dist. on the N shore of L. Superior and Bwy 17, 94 km. SE of Nipigon. Pop. 119. In Thunder Bay Dist. 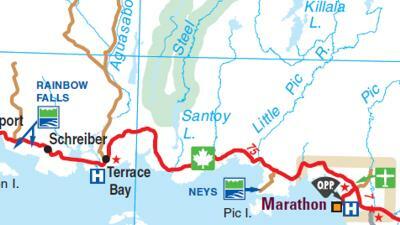 on Nipigon Bay of Lake Superior and Hwy 17, 81 km. SE of Nipigon. Pop. 79. In Thunder Bay Dist. onL. Superior and Hwy627, 4.5 km S of Hwy 17,13 km SE of Marathon. The community developed around 1885 after the CPR transcontinental rail line was completed. Pop. 600. In Thunder Bay Dist. on Hwy 527,242 kIn N of Thunder Bay, 26 km. NW of L. Nipigon. Pop. 292. In Danford T., Thunder Bay Dist., on the Kawashkagama R. 2 km. NW of Kawashkagama L. and Hwy 643, 78 km. N of Geraldton. The Aroland Logging Company built a sawmill here in the 1930s.